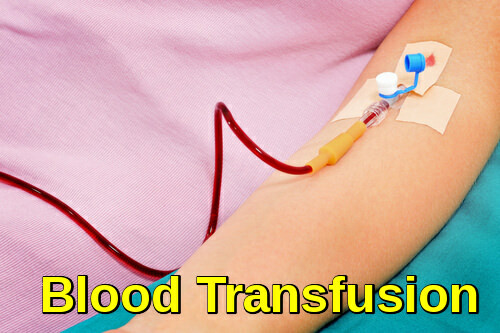 Transfusion medicine is the branch of medicine that is concerned with transfusion of blood and blood components. 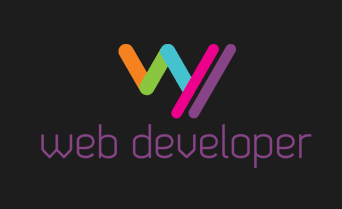 It encompasses issues of blood donation, immunohematology and other laboratory testing, transfusion practices, therapeutic apheresis, stem cell collections, cellular therapy, and coagulation. Laboratory management and understanding of state and federal regulations related to blood products are also a large part of the field. Must be at least 16 years of age, or in accordance with state law. Must weigh at least 50 kilograms. Must pass the physical and health history exam given before donation. Typing: ABO group (blood type). 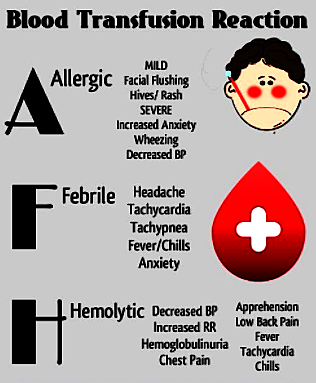 Rh typing (positive or negative antigen). Screening for any unexpected red blood cell antibodies that may cause problems in the recipient. Irradiation to blood cells is performed to disable any T-lymphocytes present in the donated blood (T-lymphocytes can cause a reaction when transfused, but can also cause graft-versus-host problems with repeated exposure to foreign cells). Transfusion-associated graft versus host disease (TA-GvHD) is a rare but almost lethal complication of blood transfusion in immunocompromised patients. To prevent TA-GvHD, irradiated blood products should be given to patients at risk: patients after bone marrow transplantation, newborns and children in the 1st year, patients with severe combined immunodeficiency, and patients receiving blood from first-degree relatives. Patients treated with purine analogue drugs (Fludarabine, Cladribine, and deoxycoformycin) should receive irradiated blood components indefinitely. The situation with other purine analogues such as Bendamustine and clofarabine is unclear, but the use of irradiated blood components is recommended as these agents have a similar mode of action. Irradiated blood components should be used after alemtuzumab (anti- CD52) therapy. Cellular blood components are irradiated by either X-ray or irradiation and are identified by an approved overstick label which should include the date of irradiation and any reduction in shelf life. The minimum dose achieved in the irradiation volume should be 25Gy, with no part receiving more than 50Gy. Red cells may be irradiated at any time up to 14 days after collection, and thereafter stored for a further 14 days from irradiation. Where the patient is at particular risk from hyperkalemia, e.g. intrauterine or neonatal exchange transfusion, it is recommended that red cells be transfused within 24 hrs of irradiation or cells are washed. Platelets can be irradiated at any stage during storage and can thereafter be stored up to their normal shelf life after collection. Granulocytes for all recipients should be irradiated before issue, and thereafter transfused with minimum delay. Irradiated components not used for the intended recipient can be safely returned to stock to be used for recipients who do not require irradiated components. The reduction in shelf life must be observed. It is not necessary to irradiate fresh frozen plasma, cryoprecipitate or fractionated blood products. Leukocyte-reduced blood has been filtered to remove the white blood cells that contain antibodies that can cause fevers in the recipient of the transfusion (These antibodies, with repeated transfusions, may also increase a recipient’s risk of reactions to subsequent transfusions). Red blood cells: These cells carry oxygen to the tissues in the body and are commonly used in the treatment of anemia. Platelets: They help the blood to clot and are used in the treatment of leukemia and other forms of cancer. White blood cells: These cells help to fight infection, and aid in the immune process. Provides proteins for blood clotting. Balances the levels of sodium and potassium. 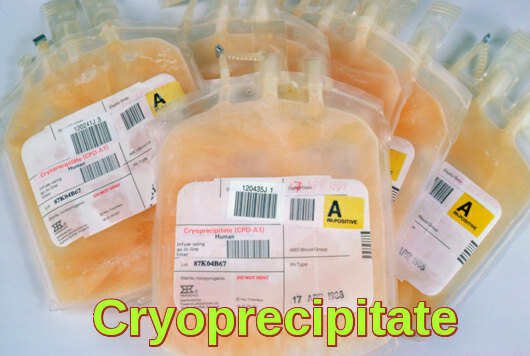 Cryoprecipitate AHF: The portion of the plasma that contains clotting factors that help to control bleeding. Albumin, immune globulins, and clotting factor concentrates: may also be separated and processed for transfusions. A sudden loss of blood due to an accident or injury. Blood loss as a result of surgery. A low hemoglobin level before, during, or after surgery. Severe heart, lung, liver, or kidney disease. Moderate to severe anemia (decreased red blood cells). Human blood is made of a fluid called plasma. 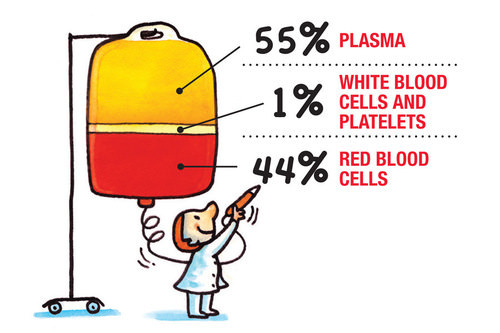 Plasma carries red and white blood cells and platelets. Each part of blood has a special function. These parts can be separated from each other. Bone marrow, the soft, spongy material in the center of the bones, makes most of the body’s blood cells. Red blood cells: These cells carry oxygen from your lungs to other body organs. They also carry carbon dioxide back to the lungs to be breathed out (exhaled). The body needs a certain number of these cells to work well. Bleeding due to injury, surgery, or disease may cause a low red blood cell count. This is the most common type of transfusion. White blood cells: These cells fight infections by destroying bacteria, viruses, and other germs. White blood cells are rarely transfused. They are often set aside as a short-term (temporary) treatment for people with a low white cell count and severe infection that has not responded to antibiotics. 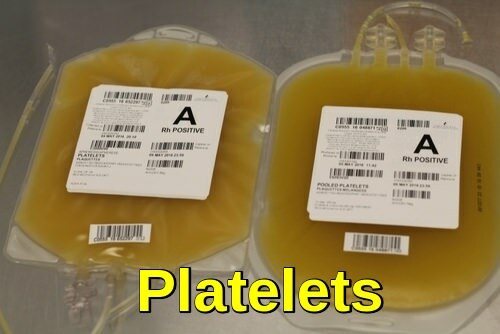 Platelets: These little pieces of blood cells help blood to clot. Your body may not make enough platelets. This might be due to bone marrow disorders, increased destruction of platelets, or medicines such as chemotherapy. Platelets may be transfused before a procedure that may cause a person with a low platelet count to bleed. Plasma: This fluid carries the blood cells all over the body. It contains proteins, vitamins, and minerals. Some of the proteins also help blood to clot. 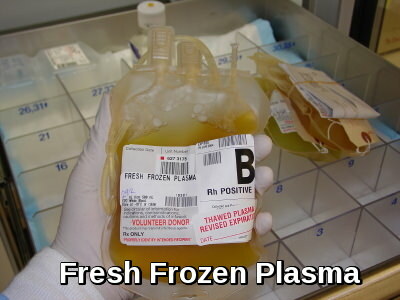 Plasma or fresh frozen plasma can be transfused in people who severely lack certain parts of the blood that help with clotting. Most hospitals use blood from volunteer donors. These donors are not paid for giving blood or blood products. Each blood donor must answer medical history questions and have a limited physical exam before being accepted as a donor. Donated blood is carefully tested, which lowers the chances of transfusion-related infections. Acute hemolytic reaction due to ABO incompatibility. Early recognition of symptoms suggestive of a transfusion reaction and prompt reporting to the blood bank is essential. The most common symptoms are chills, rigor, fever, dyspnea, light-headedness, urticaria, itching, and flank pain. If any of these symptoms (other than localized urticaria and itching) occur, the transfusion should be stopped immediately and the IV line kept open with normal saline. 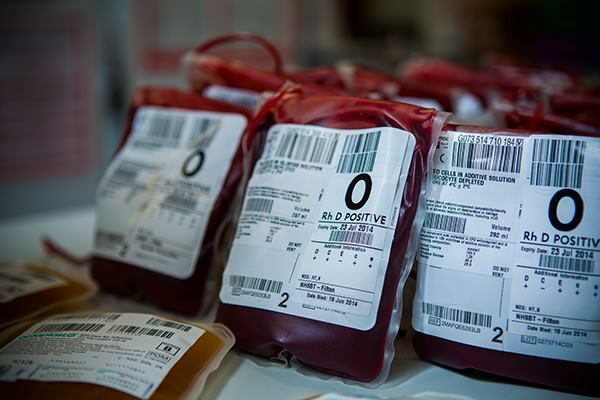 The remainder of the blood product and clotted and anticoagulated samples of the patient’s blood should be sent to the blood bank for investigation. 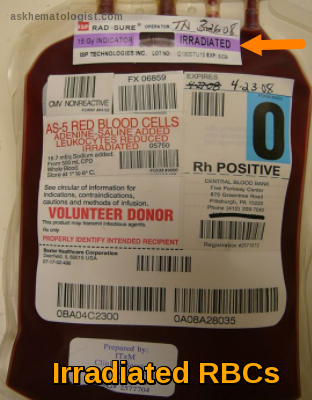 Note: The unit in question should not be restarted, and transfusion of any previously issued unit should not be initiated.Further transfusion should be delayed until the cause of the reaction is known, unless the need is urgent, in which case type O Rh-negative RBCs should be used. Hemolysis of donor or recipient RBCs (usually the former) during or after transfusion can result from ABO/Rh incompatibility, plasma antibodies, or hemolyzed or fragile RBCs (eg, by overwarming stored blood or contact with hypotonic IV solutions). Hemolysis is most common and most severe when incompatible donor RBCs are hemolyzed by antibodies in the recipient’s plasma. Hemolytic reactions may be acute (within 24 h) or delayed (from 1 to 14 days). Most febrile reactions are treated successfully with acetaminophen and, if necessary, diphenhydramine. Patients should also be treated (eg, with acetaminophen) before future transfusions. If a recipient has experienced more than one febrile reaction, special leukoreduction filters are used during future transfusions; most hospitals use prestorage, leukoreduced blood components. 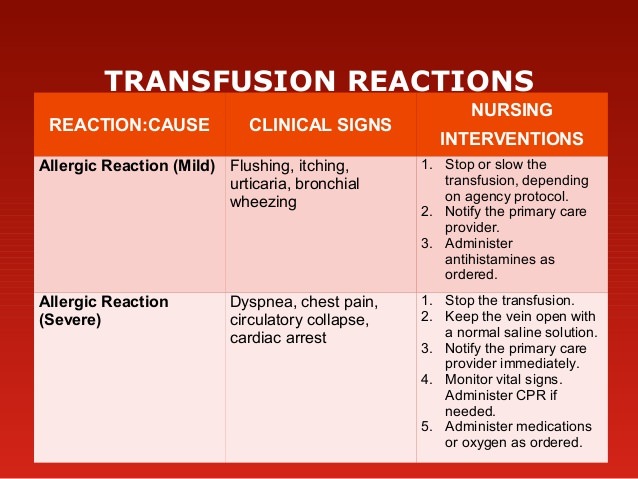 Delayed hemolytic transfusion reactions (DHTRs) occur in patients who have received transfusions in the past. These patients may have very low antibody titers that are undetectable on pretransfusion testing, so that seemingly compatible units of red blood cells (RBCs) are transfused. Exposure to antigen-positive RBCs then provokes an anamnestic response and increased synthesis of the corresponding antibody. 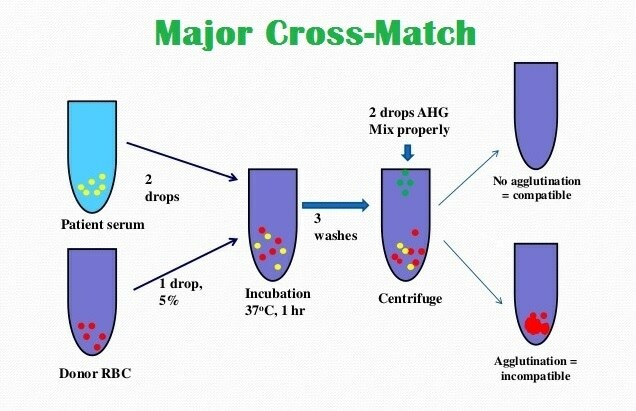 After several days, the antibody titer becomes high enough to hemolyze transfused RBCs. 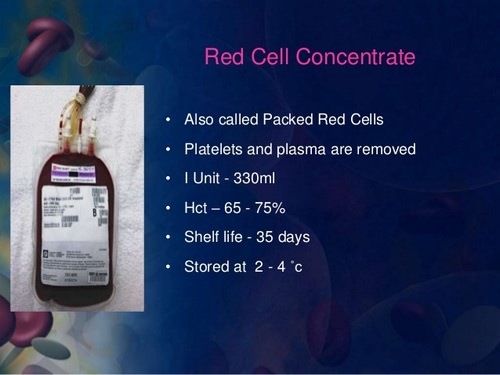 The frequency of DHTRs is estimated to be approximately 1 case per 5400 red cell units transfused. Directed blood donation: This is when friends or family donate blood for a certain person. This blood is set aside for that person’s use. This type of donation requires a prescription and must be scheduled in advance. Direct blood donations go through the same testing as other volunteer donations. If the person does not use this donated blood, it may be made available for someone else. Donating blood for yourself (autologous donation): This is your blood that you donate for your own use. It is set aside and can be transfused back into your own body if needed for a later, planned surgery. This type of donation requires a prescription from your provider and is scheduled in advance. It does not go through the same testing as other blood donations. If you don’t use the blood, it is thrown away. Before blood is given to you, it is crossmatched with your own blood to make sure it is compatible. Your temperature, blood pressure, and heart rate will be checked many times while the blood is being given. It may take a few hours to complete the process. After you have received the blood as requested by your healthcare provider, the IV that was placed in your arm will be removed and you will be discharged. You will be able to go back to your normal activities unless your healthcare provider has made other recommendations.